Up until I visited Judson Studios last summer, I had no idea what a Garvanza was (other than a bean). Now it’s one of my favorite Los Angeles communities thanks, in part, to homes like this. 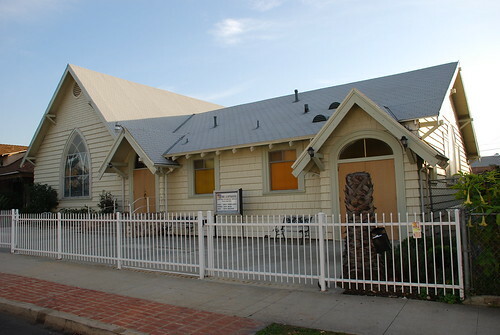 The Los Angeles’s Zoning and Map Access System, or ZIMAS, lists five buildings on the property, the oldest dating back to 1888. (ZIMAS also lets us know there are no oil wells on the land.) However, Gebhard and Winter’s Los Angeles: An Architectural Guide, reports the home was built in 1889 by architect James H. Bradbeer. 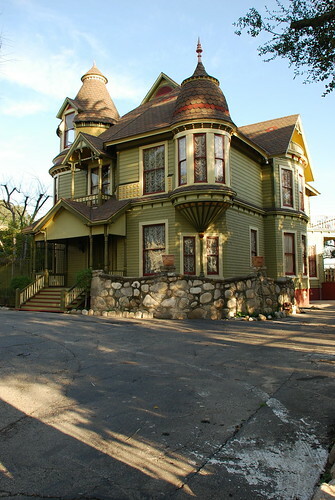 More interestingly, the latter was the only source I found to call this Queen Anne/Eastlake home the McClure House. If this was McClure’s house it saw a lot of parties, his wife being quite the hostess. In the early summer of 1890, Mrs McClure held a reception for newlyweds Charles and Dora Quein. "The spacious parlors were beautifully decorated with plants and flowers, and these together with the tasteful toilets of the ladies made a beautiful picture…" Later, "… a short but very enjoyable musical and literary programme was given, Mrs. McClure giving several selections in her own inimitable style…"
What the hell? Why would women take toilets to a wedding reception, tasteful or not? That Mrs McClure must’ve been a riot. A few years later, she hosted a “Methodist social” in the house. Rev. Mr. Hardie gave a very instructive talk on subjects suggested by pictures on the wall of what was very happily called the children’s room. B. Donnell favored the company with a recitation that was loudly applauded. The little folks sang two or three selections; their voices sounded very sweet, accompanied by Mrs. McClure on the guitar. And last but not least the dining-room with its profusion of roses and tables loaded with good things that were served in a dainty way by the hostess and her assistants. Mr McClure was absent. I wonder why. So, just to be clear. I’m not positive this was the home of civil engineer W.F. McClure and his guitar-slinging wife. And, unfortunately, to do further research, I’d need to get up off my couch. So we’ve reached an impasse. In any event, the house looks in great shape – so great, in fact, I’m willing to overlook the front lawn being smothered in cement. 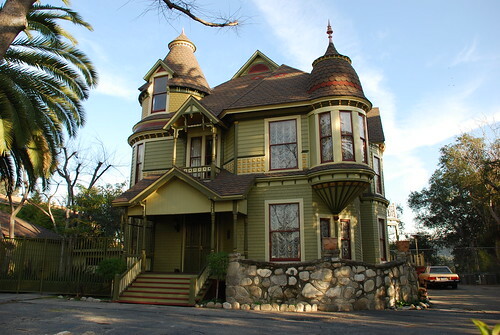 1/27/08 update: Jeffrey Herr, in his 2002 book, Landmark L.A: Historic-Cultural Monuments of Los Angeles, also names this the McClure House for W.F. McClure. Herr reports McClure was a director for the Garvanza Land Company. 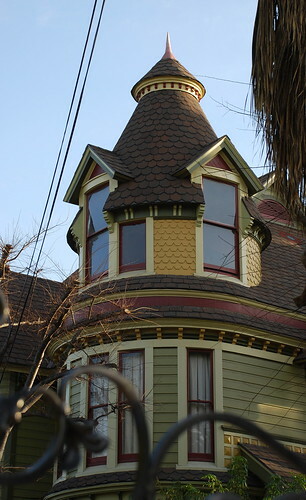 He also says the house is attributed to architect Joseph Cather Newsom, who did some work for the company. If that's so, then who was James H. Bradbeer? I think they mean "toilet" in the sense of a woman's outfit and grooming. Although the idea of ladies schlepping bathroom appliances around is really funny!